Following on from Islamophobia Really Is a Twin of Anti-Semitism . . . . 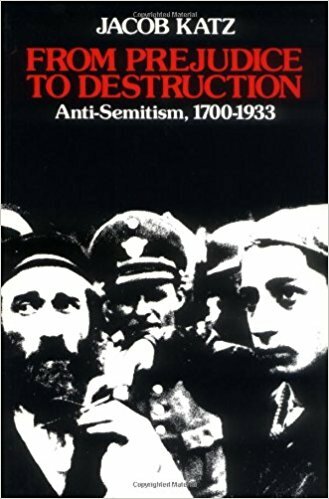 I find it interesting to compare the various attitudes towards Jews in France between 1780 and 1880 (chapter 8 and others of Jacob Katz’s From Prejudice to Destruction: Anti-Semitism, 1700-1933) with attitudes towards Muslims that we are witnessing today. In Australia (and the situation does not seem to me to be very dissimilar in other Western countries) we have divided social attitudes towards Muslims. Some of us are willing to welcome the Muslim community, especially recent refugee arrivals, with open arms. Others are worried that too easily accepting them brings problems: their values are too different; they do not assimilate; they protect would-be terrorists; they sympathize with terrorists; they pose a threat to the future cultural landscape of the country; they threaten to introduce sharia law. So it is interesting to read of a similar divide in nineteenth century French society. Though a minority, it appears, were willing to carry on the hopes of rights for the Jews that the French Revolution seemed for a moment to promise, others could not put aside their fears and suspicions concerning the consequences of Jews being fully accepted as equals with equal rights. Their values were too different; they did not assimilate; they were capable of any crime imaginable, “cheating, forgery, treason” (after all, they were all the children of deicides); they posed a threat to the wellbeing of non Jews — they would reduce other French people to destitution; they cheated and robbed in their business dealings; they had no moral principles worthy of a civilized community; etc. As long as Jews kept to themselves they were seen as incorrigibly unfit for mainstream French society; when some Jews took advantage of certain liberties introduced with the French Revolution and gained positions as heads of major companies or teachers in universities, they were seen as an even greater threat to the long-term well-being of society. Interestingly throughout the years up to 1880 the authors of major works warning the French nation about the Jewish threat to society did not see the “degenerate nature” of the Jews as racially determined. They viewed the problem as primarily a cultural and religious one; the Jews were “damaged” by their primitive religious beliefs and customs. Many anti-semites, among socialists like Fourier and among the clergy of the church, believed that Jews could become worthwhile citizens eventually, but only through being isolated from their communities and undergoing thorough “re-education”, or by becoming Christians and leaving their Jewish ways and associates entirely. The biological determinism concept — what we tend to think of as the essence of racism — emerged only later in France. Anti-semitism was not at this time a “racist” phenomenon. But it was anti-semitism no less. So those today who insist that their “Islamophobia” or their “critical pronouncements about Muslims” and the threat they pose to society today is not racism and therefore cannot be compared with anti-semitism are not quite correct. Another interesting contemporary rhyme with history is the few names of the minority group who do come over to the mainstream society and turn against their former religious group. Some of these converts (e.g. Theodore and Alphonse Ratisbonne) had in fact grown up with an education that contained relatively minimal Jewish content, or had had negative experiences that estranged them from their Jewish communities, so it was easy for such persons to break away and turn on their fellow Jews. But their Jewish history nonetheless gave them a prominent status within the Church and wider society as “Jews who had seen the light”. These converts, we can well imagine, were excellent propaganda value to “proving” just how degenerate the Jews they left behind really were. Just some passing thoughts as I continue to read Katz. Posted on 2017-09-01 11:52:23 GMT+0000 by Neil Godfrey. This entry was posted in Politics & Society and tagged Islamophobia, Katz: From Prejudice to Destruction, Racism. Bookmark the permalink. Hatred of Jews is as old as Christianity and an integral part of it. The fact that Jews gained rights during the Enlightenment only aggravated and grew antisemitism. Antisemitism is a word invented by people who hated Jews to make the hatred of Jews sound scientifically justified in the scientific era. Islam’s emergence didn’t have any substantial effect on Christianity itself, it just created a triangle of conflict in which Christians would use Jews as a justification for wresting Israel from Muslims, a position they maintain to this very day at our great expense. The fact that modern Muslims control oil-rich nations creates a context in which rich Muslims could be directly compared to the notion of rich Jews from the Enlightenment, but aside from the fact that there are comparatively far more richer Muslims than Jews, the notion of the rich Jew is one who loans money at high interest rates (usury), which Muslims aren’t known for at all.